A priest tells the story of the time during the 70’s that he was living in a monastery in New York. It seems that while living there he had numerous millionaire friends who enjoyed his company and would invite him out. He recalls on one occasion being invited to a swank restaurant and a Broadway play. During the intermission, he and his friends went out for some fresh air and engaged in a rather highbrow conversation regarding the play. As he was going about trying to impress his friends with his intellectual savvy he noticed someone walking toward him who was “not one of the beautiful people.” Her clothes were a bit tattered, her shoes worn, and her nylons had holes. As she approached he also noticed that she was peddling the Variety magazine for $0.75, so in a gesture of extreme generosity he handed her a dollar and casually waved her away, eager to wow his friends a bit more. Cindy Jacobs, self described Prophet to world influencers, conducted a prayer service for the economy in New York and in twelve other locations around the country. As part of that prayer service, she and many others gathered around and laid hands on the 7,000 pound bronze bull near Wall Street. Never mind the fact that the picture gave me the willies when I saw it (images of another “Golden Calf” in the time of Moses popping into my head) and never mind the fact that nowhere is Holy Scripture does Jesus ask us to go and pray for banks and what not, but I had to ask myself: how many of the poor and dispossessed of New York did they literally have to step over in order to get there? In another event, a church raised tens of thousands of dollars to send a dozen members on a mission trip to New Orleans to help rebuild after hurricane Katrina. A worthy cause, yet within their own community there are literally hundreds of homeless people with over 25% of them being children. In their 100 year history, that church never raised anything for a mission trip within their own community. How many could have benefited from such an outpouring of Christian good will? 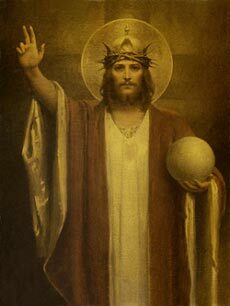 Today is the feast day of Christ the King. It is the last Sunday of the Season of Pentecost and of the church year. This day completes the Christian journey through the life of Jesus Christ on earth and in heaven, which began with the preparation for the birth of Jesus in Advent. When you and I think of Kings, we often think of absolute rulers. They attain power by raising and leading armies into war against other countries. They demand obedience. They are the lawmakers and enforcers. They expect to be served and waited on hand and foot. In many respects we see them as tyrants. A quick glance at the history of monarchs will only confirm this. Yet the King we come to worship today is not like this. Jesus said, “The kings of the Gentiles lord it over them; and those who exercise authority over them call themselves Benefactors. But you are not to be like that. Instead, the greatest among you should be like the youngest, and the one who rules like the one who serves. For who is greater, the one who is at the table or the one who serves? Is it not the one who is at the table? But I am among you as one who serves.” I am among you as one who serves. That is our King and that is the example he sets for you and I to follow. As a Christian people, I watch you all serve everyday in many different capacities. You are following the example of Christ; however, there is one very important aspect of this serving we must keep in mind: so often we think in order to serve Christ the King we must go to the ends of the earth and fulfill great schemes – lay hands on the Wall Street Bull or go on mission trips to far off places – however, I would suggest to you today that Christ the King, Christ our King, is no further away than the next person you encounter. I can take ____ hand and at the same time take the hand of Christ the King – for the Kingdom of God is within them. The problem arises when we get so wrapped up in our own lives or doing those things that we believe are serving the King that we miss him when he is standing right in front of us. The first summer of seminary for almost all seminarians usually involves taking CPE, Clinical Pastoral Education. For almost all seminarians this is a dreaded experience, lots of complaining and rolling of eyes. When I entered into my CPE class, I brought this attitude with me. New age hocus pocus that’s going to get me in touch with my feelings. Bleh! The idea of the course is to put you in the context of pastoral ministry and caring for those in need, while at the same time hopefully teaching you to not bring your own set of issues, opinions, prejudices, etc. to ministry events. Some of you may think I need to retake the course, but I did learn a few things. One event in particular shaped a good bit of how I approach every opportunity God presents to me for ministry. It was a routine visit to the hospice unit – if you can call what I did a visit. It was expected that we would spend at least a half hour on each call, so when I arrived I spoke to the patient briefly, read a Psalm, and said a prayer. However, when there was no response from him, I sat back in my chair and spent the next twenty-six of my mandated thirty minutes planning my weekend and preparing a shopping list. When my time was up, I stood briefly at the foot of his bed, said “God bless you,” and got on with my life. He died a few days later. Other than the nurses that were caring for him, I was his last visitor. Now, if you have a couple of unpleasant names running through your mind that you would like to label me with because of my actions, then feel free, but I can assure you that every time I recall that event, I call myself much worse. Each time I recall that event, I also beg the man’s forgiveness. Therefore, instead of seeing the people that God places in your immediate path as obstacles or hindrances to you obtaining your own goals, be present to them, take them by the hand, and see them as Christ the King. Like Jesus, be among them as one who serves. See those souls as an opportunity for you to pour out the love and grace of God upon them in the same manner that God has poured out His love and grace upon you.